While our family do lots of bush walking this would be our first time staying in a hut. 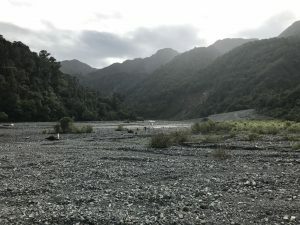 We chose this area as it was easily accessible to us (about an hour’s drive from Wellington), flat-ish walking and bookable huts that are sole occupancy. We went with another family and had a ball. The kids were 7 and 8 and didn’t complain once. There are 6 huts in various locations in the Rimutaka Forest Park so it’s worth checking the distance to the hut you plan to book. The hut had pots, pans, a gas burner and grill, plates and cutlery – all things that we therefore didn’t need to carry with us. The walking was easy and because we went with another family, everyone had someone else to talk to outside of our own family. 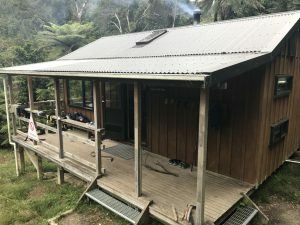 Spending a night in the bush, away from everyone else (Papatahi is the furthest hut), so light pollution and wifi were replaced with the sounds of kiwi and morepork. It was magical. For a Saturday night in summer, you have to book this hut months in advance. Setting a calendar reminder to do this for e.g. August would be a good idea. Booking so far in advance means you’re subject to whatever the weather is doing on the day. There was a huge storm in the 24 hours leading up to our trip and we had to cross a river multiple times. We had no idea if this was going to be possible even as we walked. Luckily we left early enough in the day to be able to turn back and go home if the river wasn’t safe to cross. Even though it was a single occupancy hut, sleep was hard to come by. The temperature difference between the bottom and top bunks meant we were boiling while those at ground level were cool. Pack light everyone should be able to manage without any ‘luxury’ items for one night. Going back to basics is part of the experience! But pack with safety in mind – a basic first aid kit, a rain & wind proof jacket for everyone and merino layer are all good options. Having enough water for each person for the trip in is also a good idea. Once at the hut, the water was fine to replenish drinking bottles. Take a one-pot meal that is easy to heat up using a gas ring or grill. There’s no electricity so having a light or torch can be a good idea. If it’s a clear evening, make sure you go outside to listen to the birds and watch the first stars come out. Take some dry kindling or a fire lighter if you think you’ll light the wood burner. And while there will probably be matches, it doesn’t harm to take a pack in a ziplock bag. Marshmallows are good for roasting too!! For more ideas of what to take, have a look here.